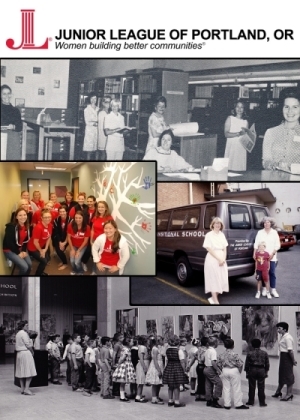 The PSU Library’s fall term exhibit highlights 104 years of contributions to the local community by the Junior League of Portland. The Junior League, a member of the Association of Junior Leagues International, is an organization of women committed to promoting voluntarism, developing the potential of women, and improving communities through the effective action and leadership of trained volunteers. The exhibit illustrates JLP’s origins, fundraising endeavors, historic preservation initiatives, community arts programs, and family service programs, many of which are still thriving with the work of community volunteers. PSU Library Special Collections is home to records documenting the JLP’s administrative and public service activities from the 1920s through 2010. See the exhibit in the Library first floor elevator lobby, from September 22, 2014 to January 3, 2015. Many thanks to members of the Junior League of Portland Archives Committee, Joanne Carlson, Sarah Munro, Karen Wheeler, and PSU librarian Kris Kern, for their work curating this exhibit. Thanks to Carolee Harrison for assistance with images and for installing the exhibit.